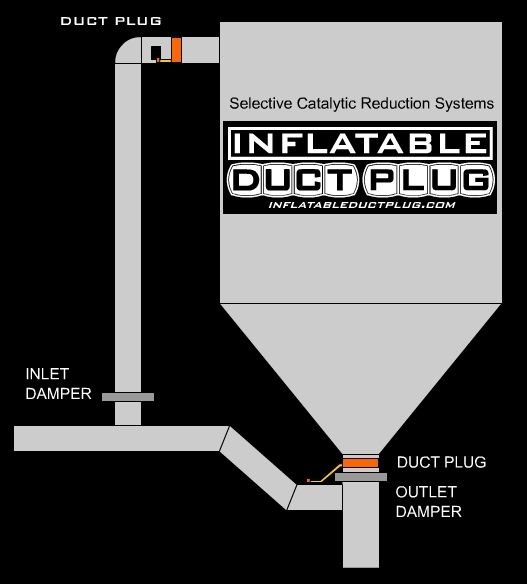 Selective Catalytic Reduction Systems are now a typical part of Coal Fired Plants and duct plug balloons can supplement and help seal these areas. The inclusion of this system has become an important part of Flue Gas Ducting. Large dampers are installed on both sides of the unit to allow this portion of the process to be isolated for regular maintenance and inspections. Mechanical seals and systems break down and over time often become less effective. Shutting down these units for a full replacement is not always feasible and can incur very large costs. Our balloons offer an economical solution to dealing with leaking dampers and degraded seals without having to do major changes to hardware in the plant. Increased depth on our products offers more grabbing power when installing a Duct Plug on the low pressure side of the existing, degraded hardware. 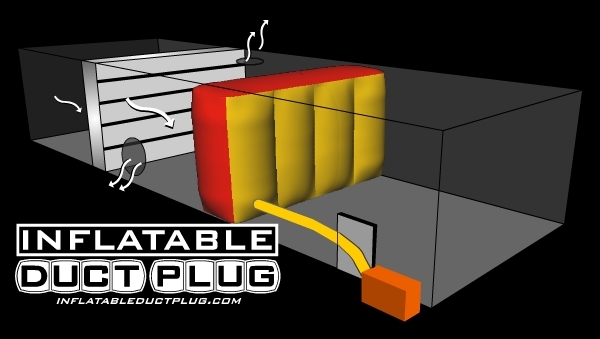 An inflatable provides a way to add additional sealing power in a very short amount of time. A Double Block and Bleed system should be used to relieve any back pressure that may occur between the existing, failing louvers and the duct plug. This is very similar to the thought process behind an isolation valve in hydraulic manifolds. Closing off two areas and allowing pressure that builds from small leaks an opportunity to escape. Any aftermarket modifications should be supervised and approved by the person in charge of regulating that all OSHA safety measures are followed at all times. These areas offer unseen dangers to the untrained eye. Materials with a rating of 500°F (260ºC) still need to be offered insulation and protection. All sources of high heat need to be treated with caution when installing Duct Plugs. Installation of the duct plug begins by unbagging the balloon in the area where it will be inflated. The perimeter of the balloon is made from a contrasting color, usually orange, to help orient the balloon when first unpacking and unfolding. 2" webbing, sewn on as handles are positioned on the face of the balloon to help with positioning and moving the inflatable. The inflation tube is fairly easy to spot and should be stretched out and untwisted prior to attaching it to the blower system. It is permanently sewn to the inflatable in a pre-determined position that will place it in the desired location in regards to the path of the blower and access doors. The blowers are typically placed outside the duct work, drawing in fresh air. At this time, the blower is powered on and will fill the inflatable with air. Prior to powering on the blower, check all zippers. An open zipper will prevent inflation. Guiding the balloon into place while it's filling can require several people. The inflation process usually takes between 6-8 minutes depending on volume and number of blowers. Duct plugs can be very large. In some cases exceeding 20' in height and over 100' in width. When sizes exceed approx 100lbs of material per unit, the inflatables are designed in sections that get laced together on site after unfolding and unpacking. 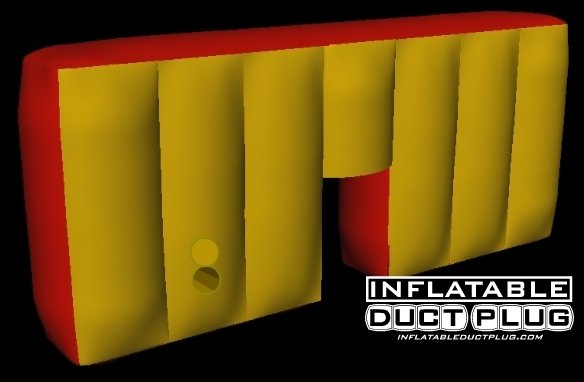 The connection point of multiple chamber inflatables is often a gromet and lace system. This provides a very strong joint between sections. All products are built to have the capability of fitting thru small openings. Almost any cross section of a deflated, stretched out, air free inflatable can be hugged by a human being. This dormant property allows the fabric to be taken thru relatively small openings and access panels. Unpacking and snaking the inflatable thru doors is sometimes required vs pushing thru a packaged unit. FGD Outlet Duct Plug with Doorway and Pass Thru Tunnels. There are occasions when a Flue Gas Ducting project requires the ability for people, hoses and other objects a way to pass through the blocked area. We have the capability to create entryways that allow a standard doorway to be installed using a wood or metal frame, fabric flaps and clamp bars for sealing around the door. This method also allows for smaller, pass through chambers to be installed that allow hoses and cords to pass thru and be sealed off using Velcro caps on the open ends. This application can be useful when isolationing or separating welding projects and volatile materials. A multiple inflation system is often called for when safety requirements hit a certain level. When that happens, more than one blower can be attached to a Y shaped inflation tube. Each blower has it's own set of louvers that prevent back flow. Multiple fans are designed to run on separate circuits. In the case of a power failure on one blower, the next blower in line allows the balloon to stay inflated and in place.